Her works have been well received for originality and diversity. Salleigh Olsen is now exhibiting at The Makery until Sunday the 30th of November. We got to ask the amazing maker some questions about her art, the female form and what she will be doing next. Tell us a little bit about your art and what you do? The work is a creation of connection to the Female form, it entices the viewer to explore and relate to the subject and enjoy their story of how she is expressed and represented through art and movement. Each creation is purposeful; the subject is in her vulnerable state yet she is confident, mysterious and beautiful and creates a story. Great photography, the intrigue of a subject and beauty. What is your favourite theme or subject to paint? Female forms although I love the simplicity and the theatrics of abstraction. People fall in love with the subject or the colours in the work connects with them or it reminds them of themselves or a time in their lives. Can you please tell us about your next project or piece of art you are going to work on? 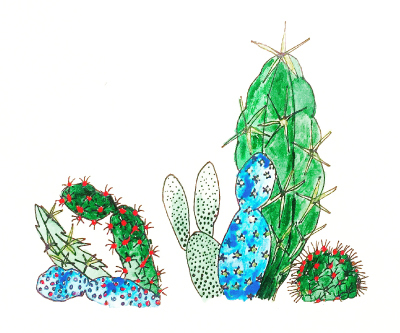 Id love to express the subjects in live art pieces, and im also really into drawing cactus’s at the moment so I’d love to do a large painting series -they are just so fascinating and diverse in their texture and form. You can find me at www.salleigholsen.com or #salleigholsenart. How Much For A Piece?